Oh, but you would be wrong. So very, very wrong. 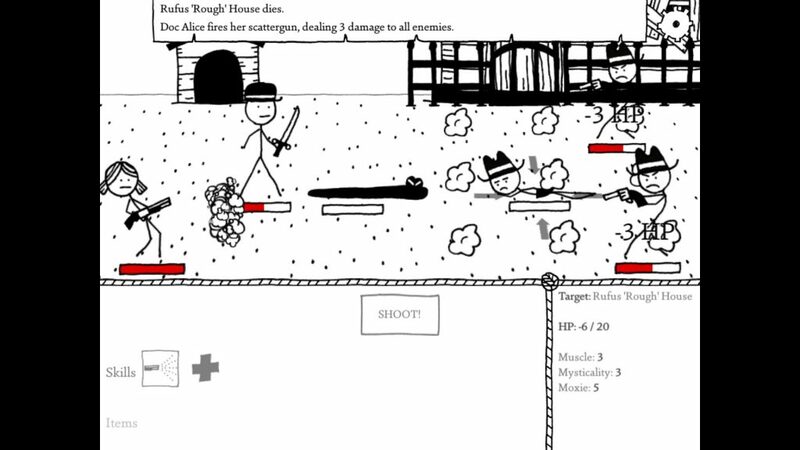 For you see, beneath West of Loathing‘s extraordinarily simple graphics lies a game that is incredibly fun, occasionally complex, and almost always ridiculous. And it just so happens to be one of the best titles that I have played this year. West of Loathing is all about you heading West because… well… you want to. There really isn’t much more detail than that. I’d even go so far as to likening it to the original Pokémon games in terms of setup. You wake up one day, say your goodbyes to your family, and leave forever. You’re determined to head West — as West as possible, even — and neither rain, nor sleet, nor demonic cows will stop you from accomplishing that goal. The game really isn’t about “completing a story”, though. It’s about aimlessly wandering around as much as you can. That’s where the real adventure is! No time for things like details or common sense, Rufus. I have to go West right NOW! I remember Asymmetric making a joke about West of Loathing when it was still in development, saying that it was basically “Skyrim with hats”. Now obviously this isn’t anything like Skyrim, but there’s actually a pretty decent comparison that you could make between the two. Heavy Bethesda hitters like TES and Fallout are less about the destination and more about the journey. The same holds true for this game. If you weren’t focused on doing anything but completing the main story, then you could probably finish things up in a few hours. But doing that would completely ruin the fun. 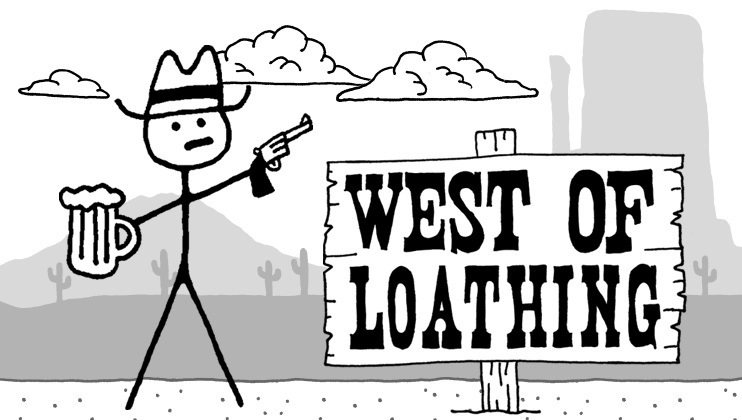 West of Loathing is filled to the brim (just like its many spittoons) with places to explore and side quests to complete, and you won’t want to miss a single one of them. 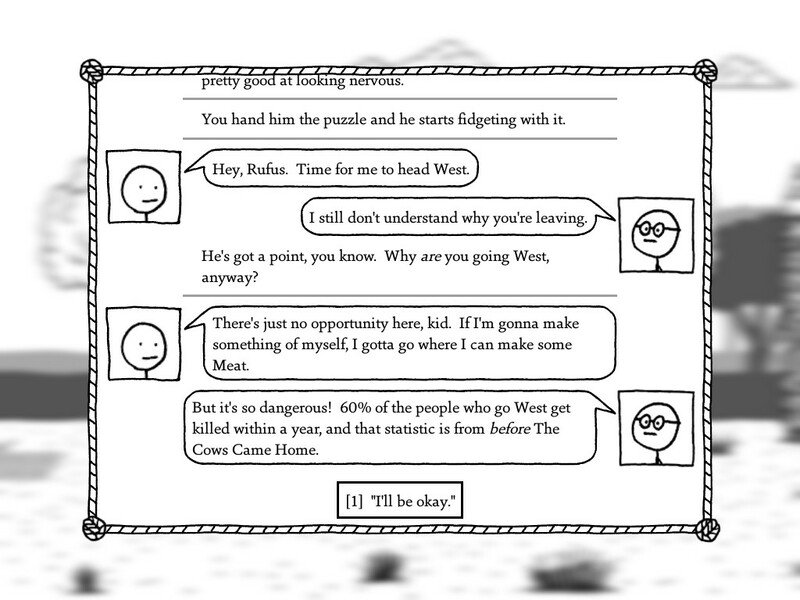 Much of West of Loathing is centered around completing quests. Considering that this is an RPG that probably isn’t too surprising, but what is surprising is the gamut of quests available for you to complete. As silly as I knew that the game was going to be, I still assumed that most of my questing would involve things like slaying monsters and saving people — you know, typical protagonist stuff. As you might have guessed however, I was mostly wrong. I really should have known better, though. What do I need to do here, again? RPGs are usually filled with people who are too inept to do things that they need done themselves. That’s good since it gives the player more to do, but West of Loathing really turned the helplessness (and laziness) of its NPCs up a few notches. Sure, there were a few a few quests involving heroics such as taking down gangs of bandits or healing the injured, but man was there a lot of weird stuff in between. This game had me helping a man with a jelly bean collection, taking pictures of a dead owl, and filling out paperwork for ghosts — and that’s only the tip of the iceberg. Wonderful weirdness aside, there was one more thing about the quests that threw me for a loop — their difficulty. For a game that doesn’t take itself seriously at all, I found myself having to stop and think quite a few times. West of Loathing has a tendency to lull you into a false sense of security with its overt wackiness, only to hit you with something like a math problem or word puzzle. They aren’t constant, but there are still enough of them to make a lasting impression. I really have to give credit to what Asymmetric did here. I’m sure that they knew that players wouldn’t necessarily take this game seriously. Adding in a head-scratcher here and there really helps to break tedium. Nothing interesting to see here, I guess. You can also bet that all of those crazy quests will have you wandering around a number of strange places, too. Sure, you may start out looking around demolished barns, snake-filled gulches, and spooky graveyards — you know, boring places — but it won’t be long until you’re venturing off to exciting locations like cereal factories, jelly bean museums, and the circus. Oh, yeah, and a giant necromancer bone tower, if that’s your kind of thing. While most of West of Loathing‘s locations are rather small, they more than make up for it with presentation. There are secrets to be found, puzzles to solve, and weirdos to befriend at every turn, and are all worth finding. Considering how much there is to do in this game you’ll probably miss a few things, but that’s what consecutive playthroughs are for! As weird as this game is, it’s still an RPG. And what do most RPGs have? No, no, not endlessly long dialogue trees. I’m talking about combat! Sheesh. 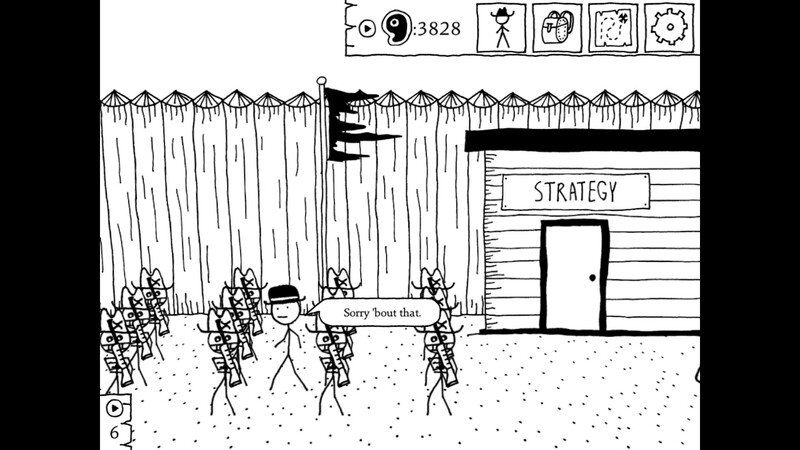 In contrast with the rest of the game, West of Loathing‘s turn-based combat is surprisingly tame. If you’ve played even one Final Fantasy or Dragon Quest Game, you pretty much know the deal when it comes to turn-based fighting. And I’m assuming that most of you have. The major difference with this game however is that combat also takes place on a grid. That means that, in most cases, your attack will hit whichever enemies are in the front, requiring a little more strategies during your fights. There are, of course, exceptions. Like this shotgun, for example. West of Loathing also features three distinct classes; Cow Puncher, Bean Slinger, and Snake Oiler (which basically boils down to Warrior, Mage, and… I don’t know, probably Thief or something). While there isn’t a large amount of divergence between these classes in the beginning, they really each come into their own as the game goes on. 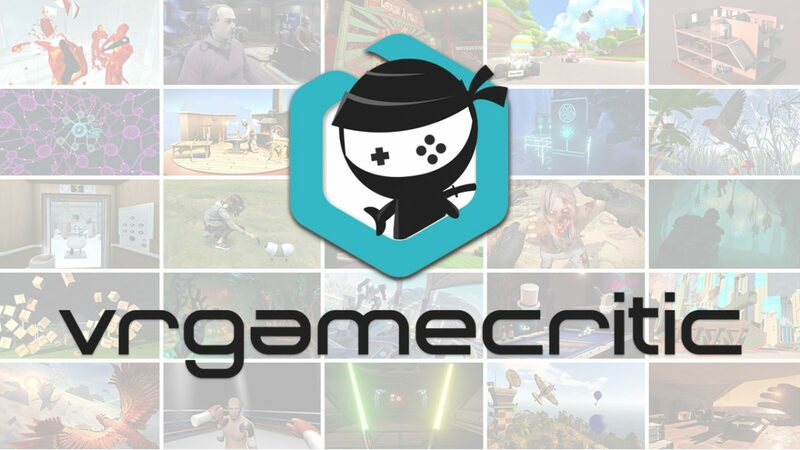 Not only will will you learn an entirely new set of skills depending on which class you choose, but you’ll also have a different set of strengths and weaknesses. There are three major types of damage and, because of the way stats work, offense and defense for each of these types are linked to a single stat. So long as you aren’t min-maxing your character to any extreme you should be fine, but the combat diversity that this setup provides is still worth noting. Combat is loads of fun, but I found it to be a little on the easy side. Instead of leveling up, the EXP accrued from battles is spent directly on stats and skill points. Since West of Loathing is what I call a “low numbers RPG”, even one or two stat points can make a big difference. And, because of how easy it is to gain EXP it isn’t difficult to become overpowered. Part of this could be me. I’m used to grinding a lot in RPGs, so there’s the chance that I overdid it a little bit. In fact, I’m sure that I did. And this is definitely a more casual RPG. Truthfully, being overpowered can be fun sometimes, and being as strong as largely did not affect how much I enjoyed battles. Still, a little bit of resistance here and there is always nice. I’m Spaghetti McCreed! Your guns can’t hurt me! West of Loathing‘s RPG mechanics go past fighting, however. It’s an honest-to-goodness role-playing adventure. With stick figures. 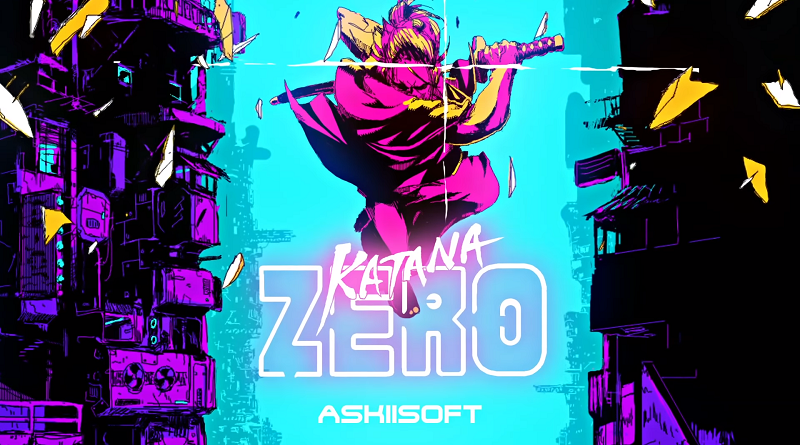 Throughout the game, you’ll learn a number of non-combat skills. Things like lockpicking, foraging, and hornswoggling (yes, that’s actually the name of the skill). Improving these skills can not only help you pick up more loot, but can change certain situations entirely. A good number of the game’s scenarios have solutions that don’t involve pumping your enemies full of lead. 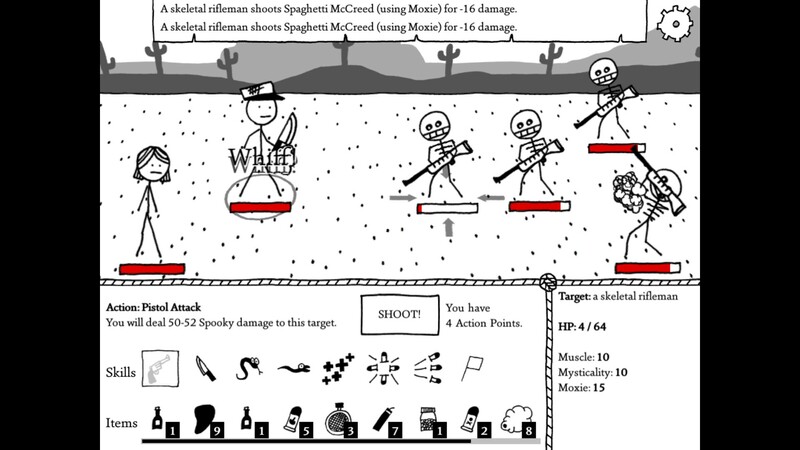 Fighting can be fun, but West of Loathing‘s non-combative routes are generally more entertaining. Often times your rewards are better, too. 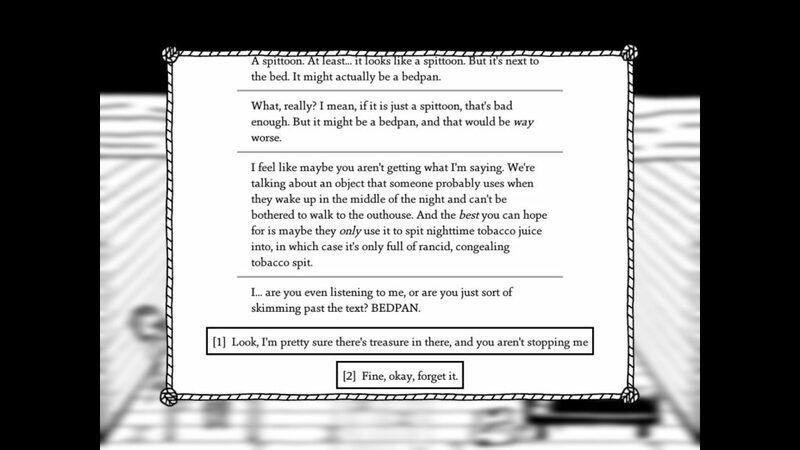 West of Loathing has solid mechanics. There’s no denying that. If you ask me though, there’s one thing that makes this game worth playing more than anything else; it’s writing. Truthfully, I’m not even entirely sure how to describe it. Initially, words like “goofy” or “funny” come to mind. I may have said this before, but it’s worth repeating; this game does not take itself seriously. Almost everything is a joke or a pun, and it is fantastic. So long as you don’t have a weak stomach, these spittoon scenes are some of the best reads in the game. What’s even more impressive however, is when you start to realize how smart some of this game’s goofiness actually is. While there’s plenty of randomness, West of Loathing throws a surprising amount of intelligent humor at you. Jokes that require (a sometimes advanced) understanding of history, language, and culture. Even if you don’t understand every single joke thrown at you (goodness knows a few of the history-related ones flew over my head), you can still laugh at them. Many of the jokes can be enjoyed on multiple levels. It’s the clever combination of setup and execution that makes every bit of the game’s script so overwhelmingly enjoyable to read. And I won’t even start on the graphically detailed spittoon scenes. I’ll just include a picture of one in this review, instead. In case it isn’t obvious, I really, really like West of Loathing. It takes everything that makes Kingdom of Loathing great, and turns it into a single-player experience. And a rather lengthy one at that. 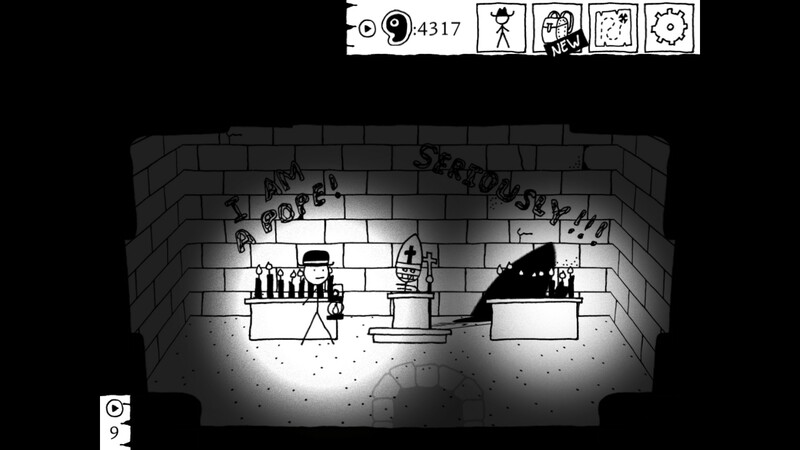 Even if RPGs aren’t normally your thing, West of Loathing‘s setup is approachable for pretty much everyone and I most definitely recommend that you check it out. After all, the West isn’t going to loath yourself! …Or maybe it will, I’m not actually sure how that works. Regardless, it’s in your best interest not to pass up on a gem like this.